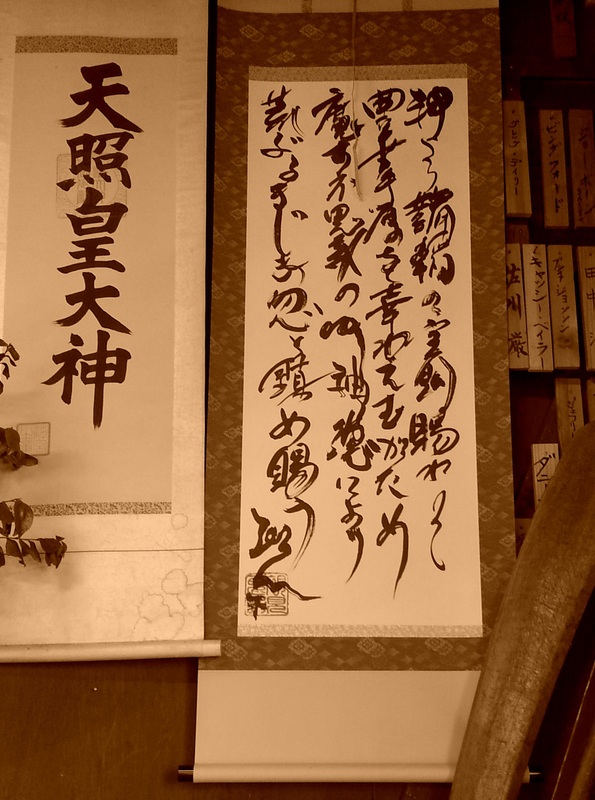 Even though the theme is Tachi Hôken (Divine treasure sword), Sensei has put this nice calligraphy in the Dôjô. As it was the case during the last Daikomyôsai, this is linked with the Kojiki, the Japanese mythology. Amateratsu no Kami, the Sun Goddess, was given the sword “Kusanagi no Tsurugi” by her brother Susanô in order to apologize (the cave). Later this sword was given by Amateratsu no Kami to Ninigi no Mikoto (her grandson and the legendary ancestor of the Imperial line) confirming his legitimacy to be the Imperor of Japan. This is the origin of the lineage concept. If my information are correct the sentence above is quite similar to the one said by Amateratsu no Kami when she gave the sword. But this one sentence was said by Takamatsu Sensei when he handed over the 9 Ryûha of the Bujinkan to Hatsumi sensei. If we make a parallel, this gives Hatsumi sensei the legitimacy over the 9 Ryûha. The general idea being: “This is the divine treasure/sword, transmitted by Takamatsu Sensei to Hatsumi Sensei, to destroy evil/demons, and to create unity and make peace reign on Earth”.